At the Energy Training Foundation’s (EnTF) annual Association of Energy Engineers (AEE) Certification Ceremony held in November 2014 another group of energy professionals received international recognition in the energy efficiency fraternity. South Africa boasts with 530 Certified Professionals in the Certified Energy Manager (CEM), Certified Measurement and Verification Professional (CMVP), Certified Energy Auditor (CEA), Certified Carbon Reduction Manager (CRM) and Certified Renewable Energy Professional (REP) out of 28,000 in the world. “As a country we have taken on the responsibility to move forward through education ourselves and becoming Certified, especially in CMVP as 6% of the total Certified professionals in the world is from South Africa”, said Prof LJ Grobler, Dean of NWU Engineering Department and Immediate Past President of the SAEE. 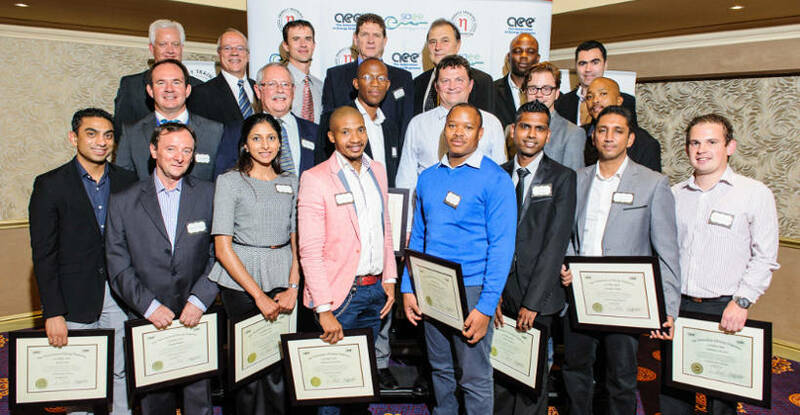 Certified Energy Managers (CEMs) receiving their international certification at the Energy Training Foundation’s (EnTF’s) Association of Energy Engineers’ (AEE) Certification Ceremony held in November 2014 at Emperors Palace in Johannesburg. Prof Grobler is one of the founders of the EnTF and has been instrumental in developing the educational programmes offered by the AEE in the Southern African region. Over 1,000 companies and more than 3,000 individuals have already benefited from EnTF and AEE training in the region since 2002. EnTF is the longest standing and most credible energy educational qualification providers in Southern Africa. The AEE has been developing the energy engineering field for over 37 years. In total AEE is active in 91 countries with the latest edition being the East Africa Chapter housed in Kenya for which EnTF is the AEE Certification Coordinator and AEE Approved Examiners. The Kenyan energy regulations stipulate that only CEM’s may work in the energy field as auditors and service providers which attests to the high esteemed value the qualification holds in Africa. Another country whom is embracing the CEM qualification is Zimbabwe, and the Zimbabwean Energy Regulatory Authority (ZERA) has awarded EnTF the tender to develop the CEM market for Zimbabwe which will commence in 2015. AEE certification programmes involve not only the training sessions and achieving a 70% passmark for the prescribed examination in the time allocated, but it requires experience and previous qualifications where experiential work is insufficient. Certification is renewed every three years to make sure AEE Professionals remain proficient within their respective energy disciplines. 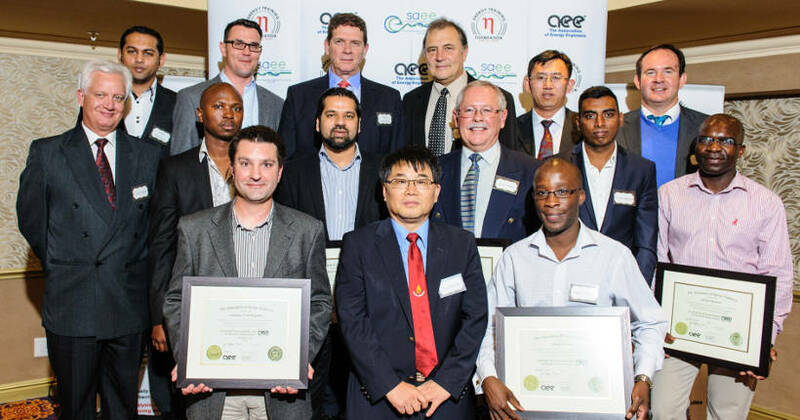 Certified Measurement and Verification Professionals (CMVPs) receiving their international certification at the Energy Training Foundation’s (EnTF’s) Association of Energy Engineers’ (AEE) Certification Ceremony held in November 2014 at Emperors Palace in Johannesburg. The Southern African Association for Energy Efficiency (SAEE) is the local chapter of the AEE, and the Energy Training Foundation (EnTF) is the sole approved training partner of the AEE for the Southern African region. All AEE courses are CPD accredited for between 2-5 credits for ECSA requirements.